Anyone who uses ReSharper is familiar with the little squiggly line indicating a “warning” of one kind or another. And anyone who develops with .NET is familiar with the ubiquitous NullReferenceException and ReSharper’s “possible ‘System.NullReferenceException'” warning. Here’s a really simple example (VS 2013 / R# 8.2) demonstrating the feature. In both cases, a string is initialized to null and then we conditionally set it to a value, before displaying the length of the string. 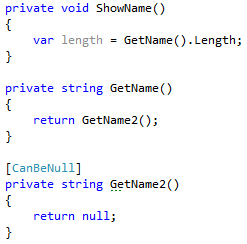 In this first snippet, ReSharper’s analysis detects that “name” will *always *be null, and underlines it to warn that accessing the “Length” property will possibly throw an exception. In this case, we know it will. 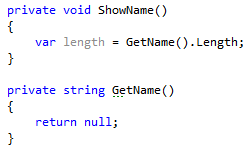 In the next snippet, ReSharper’s analysis detects that name will *never *be null, so no underline. (It also grays out the first initialization, as it’s never used). Now I’ll remove part of the code to a separate method. Obviously, a NullReferenceException will still be thrown, but ReSharper no longer warns us. The reason for the above behavior is that ReSharper can’t afford to traverse all paths and evaluate all outcomes, on-the-fly. It’d be too expensive. Yes, in this case it’s only a single method. But what about methods nested 10 deep, which then call to another assembly that needs to be decompiled, and ultimately makes a service call to some API out on the Interwebz? Instead, ReSharper uses “optimistic analysis”, which means that when it can’t determine the outcome, it doesn’t show the warning. If it were a pessimistic analyzer, it’d display the warning when it wasn’t sure. Either way, it amounts to guessing, and sometimes we may want to help it be more accurate. What if we had a way to help ReSharper? We do, actually. ReSharper can’t determine whether the method could possibly return null, but we can give it a nudge nudge wink wink, using some special attributes from JetBrains (also referred to as “annotations” or “contracts”). 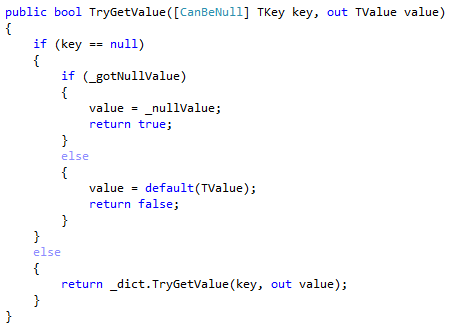 Notice the addition of the “CanBeNull” attribute in the above code. 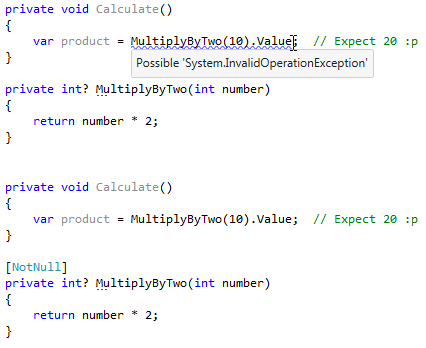 We’ve told ReSharper that the method might return null, so now it can warn other developers that happen to call it. Note that it only works one level deep. Marking a nested method which will ultimately cause a NullReferenceException does not affect the top-level call. 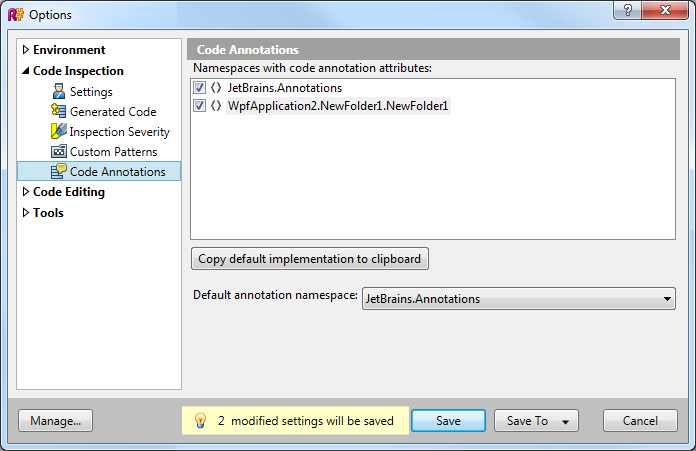 Annotations (aka “contracts”, aka attributes) like the one above are supplied by JetBrains. They created them, so we could give ReSharper a heads-up. 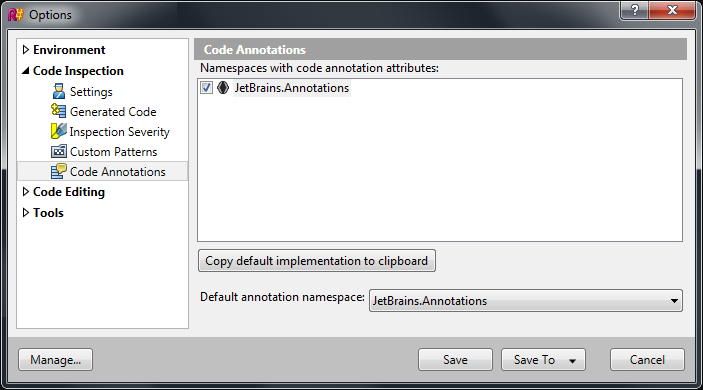 If you do not want, or are not allowed, to reference the assembly directly (or you want to modify the annotations for your own use), JetBrains has provided another method for using them. 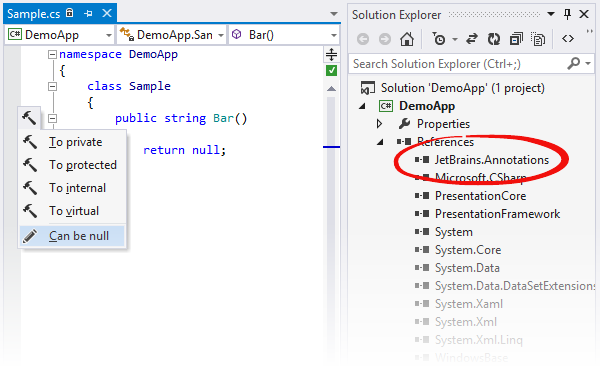 Open the ReSharper menu in VS, click on Options, and find the “Code Annotations” tab on the left. Use the button on the right to copy the annotations to your clipboard. Alternatively, you could modify the namespace and then open the Annotations settings again. ReSharper will recognize the location of the annotations (here I buried them in a couple of nested directories) and give you the option of selecting that location. Do so and save the settings, and it will respect the annotations in the new location. This gives you access to dozens of other attributes with which to adorn your code. The two that seem most useful in a variety of situations are the CanBeNull and NotNull attributes. Here’s another example, where the annotation has been applied to a parameter. Again, ReSharper doesn’t know whether or not “myString” could possibly be null, so it optimistically assumes it won’t be. But we can annotate the parameter to hint to ReSharper that “myString” may very well be null. Now we get a warning. 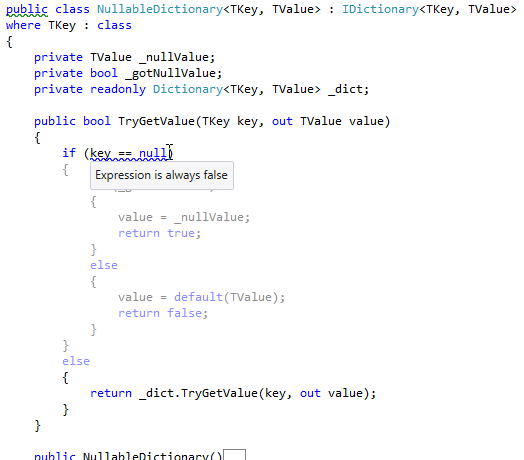 ReSharper is assuming that, since the class implements IDictionary, the key passed to TryGetValue cannot be null. (You can verify this by deleting the IDictionary interface from the class signature… the warning disappears.) I suppose it’s a cost-effective assumption, since most dictionaries would not implement a null key, but it’s certainly not a safe one. 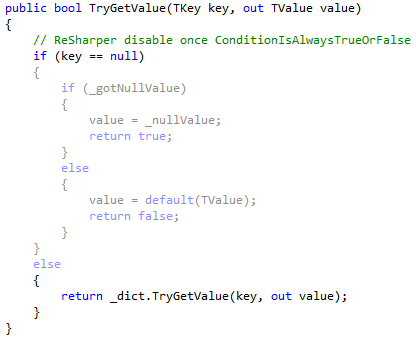 Here, we’ve got a class where the key can be null, and we want to let ReSharper know it. There are a few ways we could do this. One way is a special comment, which you can add by clicking the light bulb in the left margin, after placing the cursor on the offending piece of code. Personally, not my favorite. I don’t need more comments, and it leaves the code grayed out. You can read more about the ReSharper NullReferenceException analysis, and related annotations/contracts, at JetBrains’s website. You can also read more about the various annotations, their descriptions and a few sample usages.